creation of an active complex with ATP, so that this relationship can be used to contractions of muscle fibers during intense exercise and muscle protein synthesis. adjust the composition of the extracellular fluid and intracellular - "watch" the proper hydration of cells and thus the stimulation and inhibition of anabolic muscle catabolism. normal nerve conduction and neuromuscular - increases the threshold of neuromuscular excitability, reducing the unpleasant symptoms associated with excessive muscle contractility (pain and muscle spasms, twitching eyelids, etc.) and increasing the ability to perform physical activity. Furthermore, addition of prebiotic (inulin and vitamin B6) increases the absorption of magnesium many times in the gut . 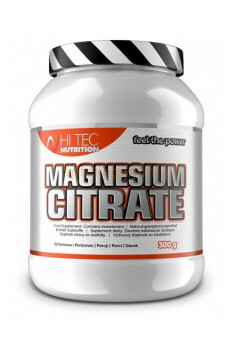 Magnesium citrate is an essential supplement for every athlete and persons living in constant stress. If you want to have a healthy heart, circulatory system and nervous łatwoprzyswajany enrich your diet with magnesium. Chronic stress, strenuous activity, excessive caffeine and a diet rich in protein, fat, salt, calcium and phosphorus promotes the formation of magnesium deficiency in the body. The products of bacterial fermentation of inulin-SCFA (Short Chain Fatty Acids) - lower the pH and also intensify the absorption of water in the colon, thus often compounded by the uptake of dietary magnesium. Magnesium reduces the unpleasant symptoms associated with excessive muscle contractility such as night pain and leg cramps, twitching eyelids. jesli magnez to tylko cytrynian, nie polecam zadnego mleczanu ani chelatów bo sa mimo wszystko gorzej przyswajalne! 1 portion - 10 g (1 tablespoon) in 250 ml of water. Apply 1 time per day. Dosage is best adapted to individual needs. The most favorable time of use it is the evening before bedtime.